The eighth annual Best Translated Book Awards were announced at BookExpo America on Wednesday, May 27, with Chinese author Can Xue’s The Last Lover taking home the award for fiction, and Spanish poet Rocío Cerón’s Diorama winning for poetry. Organized by Three Percent at the University of Rochester, the Best Translated Book Award (BTBA) is the only prize of its kind to honor the best original works of international literature and poetry published in the United States over the previous year. Each of the winning authors and translators will be given $5,000 in cash prizes from Amazon.com’s giving program. 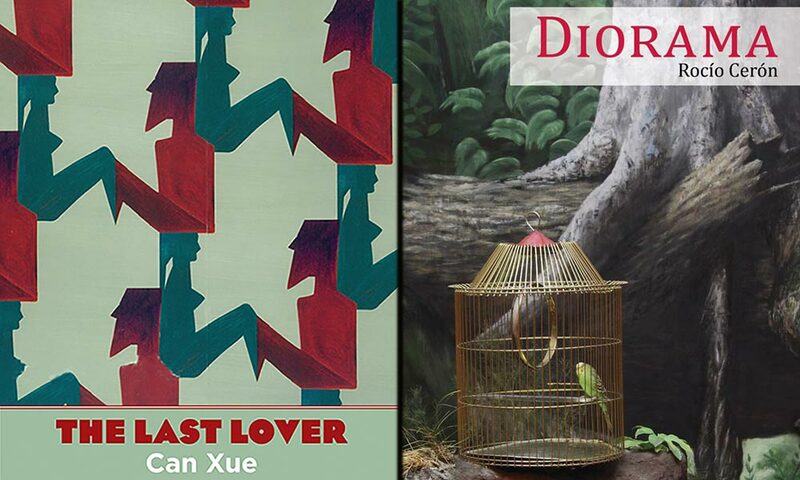 According to this year’s jury, Xue’s The Last Lover translated by Annelise Finegan, was the most radical and uncompromising of this year’s finalists, pushing the novel form into bold new territory. Published by Yale University Press, the book “takes readers on a journey through a dream world as strange yet disquietingly familiar as Kafka’s Amerika,” said Monica Carter, chair of the BTBA fiction committee. If Orientalists describe an East that exists only in the Western imagination, Xue describes “its shadow, offering a beguiling dream of a Chinese West. In addition, Annelise Finegan Wasmoen’s translation succeeds in crafting a powerful English voice for a writer of singular imagination and insight,” said Carter. Past winners of the fiction award include Seiobo There Below and Satantango, both by László Krasznahorkai (recent recipient of the Man Booker International Prize) and translated from Hungarian by Ottilie Mulzet and George Szirtes, respectively; Stone Upon Stone by Wiesław Myśliwski, translated from Polish by Bill Johnston; and, The True Deceiver by Tove Jansson, translated from Swedish by Thomas Teal. Jansson and Teal are the only author and translator on this year’s fiction shortlist who previously won the award. The nine judges who made up this year’s fiction jury are: George Carroll (North-North-West and Shelf Awareness); Monica Carter, (Salonica); James Crossley (Island Books); Scott Esposito (Conversational Reading and Center for the Art of Translation); Jeremy Garber (Powell’s Books); Katrine Øgaard Jensen (Asymptote); Madeleine LaRue (Music & Literature); Daniel Medin (American University of Paris, Cahiers Series, Quarterly Conversation and the White Review); and Michael Orthofer (Complete Review). Past poetry award winners include of the award The Guest in the Wood by Elisa Biagini, translated from Italian by Diana Thow, Sarah Stickney, and Eugene Ostashevsky; Wheel with a Single Spoke by Nichita Stănescu, translated from Romanian by Sean Cotter; and Spectacle & Pigsty by Kiwao Nomura, translated from Japanese by Kyoko Yoshida and Forrest Gander. This year’s poetry jury consisted of judges: Biswamit Dwibedy (poet); Bill Martin (translator, critic, organizer of The Bridge); Dawn Lundy Martin( poet); Erica Mena (poet and translator); and Stefan Tobler, (And Other Stories and translator). For more information, visit Three Percent, the official Best Translated Book Award site and the official BTBA Facebook page, and follow the award on Twitter. For detailed questions, contact Post at chad.post@rochester.edu or 585.319.0823.